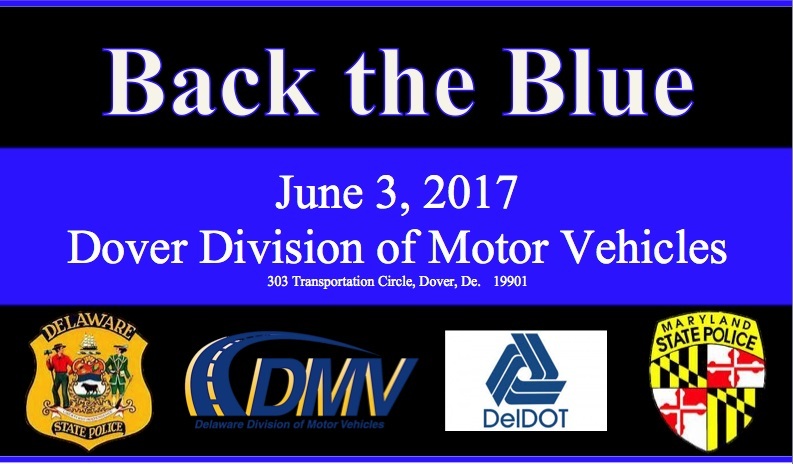 Dover – The Delaware State Police has partnered with the Maryland State Police, Delaware Division of Motor Vehicles and the Delaware Department of Transportation to have the “Back the Blue Event 3” in Dover. Please stop by the Dover Division of Motor Vehicle inspection lanes, located at 303 Transportation Circle, Dover, Delaware on Saturday, June 3, 2017 between the hours of 9:00 a.m. and 3:00 p.m. to get the blue line placed on your back window as a tribute to law enforcement officers. There is no fee for this sticker, however donations will be collected and presented to the DSTA Benevolent Fund. You will be directed to a lane and the sticker will be placed on your vehicle while you wait. If possible, please make sure your rear window is clean.